The Chill-Shield Z.P. 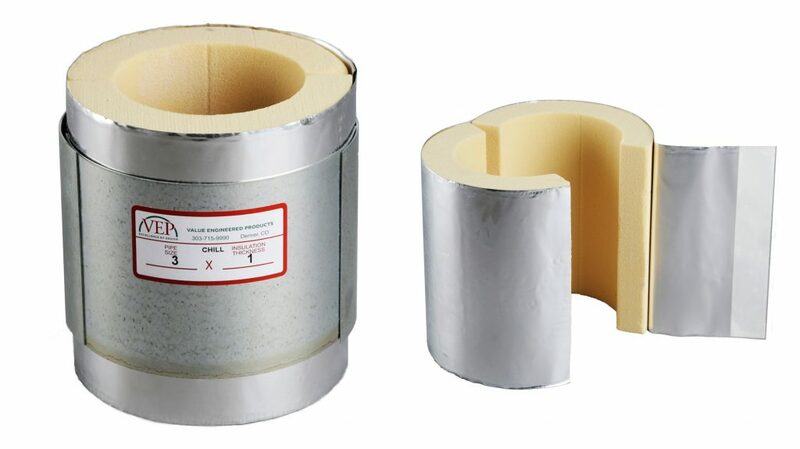 thermal hanger shield is similar to the Chill-Shield. Both are 360 degree units designed for low temperature systems. The Chill-Shield Z.P. incorporates a zero perm factory applied jacketing to comply with the most stringent requirements of cryogenic systems. The Chill-Shield Z.P. units are suitable for use in any type of clamp as well as in all band-type hangers. For indoor or outdoor use on clamping support systems, clevis or band-type hangers. Low temperature tubing systems to minus 250° F.
Available for pipe sizes 1/2 inch through 24 inches. 360o Polyisocyanurate 24 PSI material-Thermal Conductivity (‘k’) .19 @ 75° mean, 80PSI or 140 PSI material-Thermal Conductivity (‘k’) .20 @ 75° F. mean.Meeting ASTM D-1621, D-1622, D-1623, C-203, C-518 and E-84, Flame Spread -25-, Smoke Developed -450-. 360° Zero perm jacket, VentureClad 1577 CW meeting ASTM E-96, UL 723 Flame Spread-10-, Smoke Developed -20-. Adhesive complying with NFPA 90-A & ASTM E-84, Flame Spread -10-, Smoke Developed -0-. All units are asbestos free and 100% made and assembled in the U.S.A.